Washington and Lee law graduates Chris Wolf ‘80L and Joe Brown ‘68L have been honored for their work by the Anti-Defamation League (ADL). On Sunday, May 6th at its National Leadership Summit, the ADL presented Wolf, Senior Counsel at Hogan Lovells, with its Barbara Balser Lifetime Achievement Award in recognition of Wolf’s thirty years of volunteer service to ADL. Wolf’s contributions to the ADL include service as Washington, DC Regional Board Chair; National Chair of Civil Rights, Strategic Planning and Technology; Founder and Chair of the ADL Task Force on Internet Hate; Originator of ADL: In Concert Against Hate, an annual event in its 24th year at the Kennedy Center featuring the National Symphony Orchestra and honoring people who have stood up against hate; and co-author with then-National Director Abraham Foxman of the book “Viral Hate: Containing its Spread on the Internet” (Macmillan 2013). Wolf also has served on the National boards of the ADL and the ADL Foundation. Brown, who is Of Counsel at the Las Vegas law firm Kolesar & Leatham, was the recipient of the Anti-Defamation League Jurisprudence award. 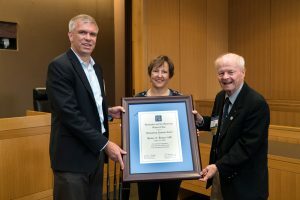 The award was established to recognize individuals who have made outstanding contributions to the legal profession and community at large while exemplifying the principles upon which the Anti-Defamation League was founded. Brown practices in the areas of government affairs, administrative law and business law. He is a former appointee of President Ronald Reagan to the State Justice Institute and the Foreign Claims Settlement Commission of the United States (1981-88) and has served as an officer or director of many businesses, civic and charitable organizations including the Nature Conservancy, the Department of Wildlife, the Nevada Development Authority, the Nevada Athletic Commission, Wells Fargo Bank, and as a commissioner for the Nevada Gaming Commission. He is the Founder and former Vice Chair of the Nevada Military Support Alliance.